The Exhale Fan requires a fan rated mounting box or support. 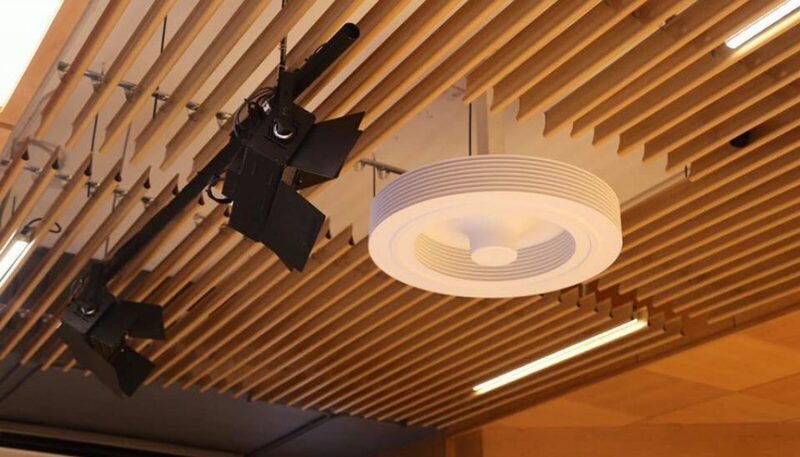 Our customers have installed Exhale Fans on a variety of ceiling types (e.g. tray, vaulted, cathedral, drop, multi-level). This can be accomplished through a 3/4″ down rod purchased from a local hardware retailer. Others have purchase fan rated mounting kits for drop/false ceilings. While our fan’s maximum theoretical performance is in a rectangular room with 4 joined walls and a flat ceiling at a height of 10′, our customers have installed our fans in irregularly shaped rooms, vaulted/cathedral/tray/multi-level ceilings and rooms with open walls enjoying our fan’s superior performance and room temperature balance. Since local hardware retailers stock fan mounting kits (e.g. down rods, joist mounts for drop ceilings), Exhale Fans does not include these kits as an option. Our fan uses its vortex to draw the cooler air up to the fan and then the fan’s disks flow the cooler air evenly in a horizontal plane at the fan’s disk level where thermodynamics will drive the cooler air downward. The net result is a balanced room from our suspended fan to the floor and wall to wall. To create a downward draft, a suspended bladed fan will push the hotter air above the fan down while our Exhale Fan will create a balanced, comfortable room.